Easy to find. It was nice that it wasn’t in downtown. The staff couldn't be more helpful. The beds were very comfortable and the rooms clean. The pool area was lovely and it was nice to sit there in the afternoon. 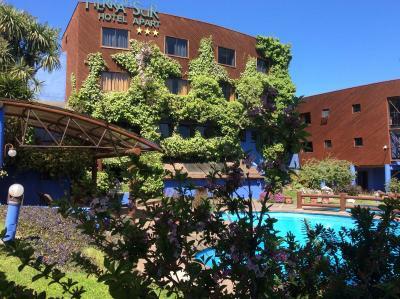 Despite the observations made below I would recommend Hotel Tierra del Sur as it is very good value for money and in an excellent location just 5 blocks from the town centre. Limpieza, ordenado y que admitan mascotas, espacios cómodos, atención muy buena. Preciosas habitaciones y entorno, con derecho a piscina y baños sauna. Ubicación privilegiada. Comodidad y limpieza destacable, nuestra familia adoro el lugar, nos encanto que hubiese tv en cada dormitorio ya que los niños pudieron ver sus programas. Cada vez que vaya a temuco que quedaré en este lugar. En lineas generales bien. El desayuno está bien. La habitación es cómoda. El personal del hotel muy amable, la habitacion comoda y la piscina siempre limpia !! A swimming pool with plenty of sun, surrounded by a charming garden can be enjoyed in Temuco. The main square is only 4 blocks away. Free WiFi access is available in this property. A continental breakfast can be enjoyed daily. 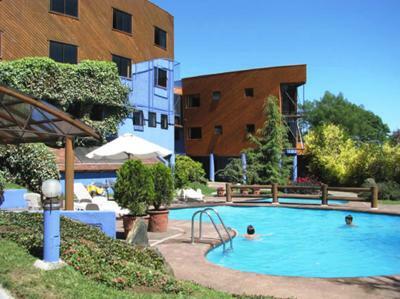 Hotel Tierra del Sur has comfortable rooms with cable TV and private bathrooms with showers. Apartments with kitchenettes and mini-bars are also available. 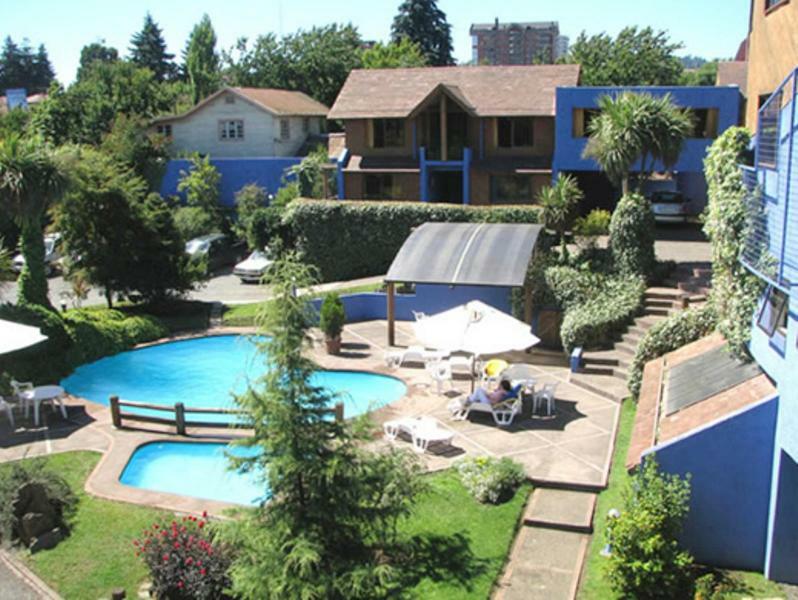 Tierra del Sur is a 5-minute drive from Temuco’s shopping area. Shuttles to the airport, 6.2 mi away, can be arranged. The hotel offers a handy currency exchange service and 24-hour front desk assistance. When would you like to stay at Hotel Tierra del Sur? A practical room with cable TV and a private bathroom. 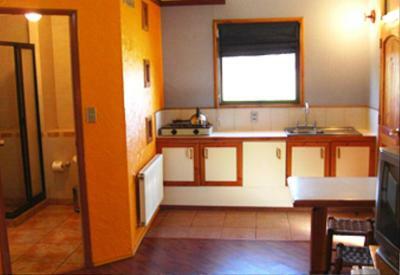 A practical apartment with a kitchenette, cable TV and a private bathroom. House Rules Hotel Tierra del Sur takes special requests – add in the next step! Hotel Tierra del Sur accepts these cards and reserves the right to temporarily hold an amount prior to arrival. Please note the sauna only operates on Monday, Friday and Saturday from 14:00 to 21:00. During these times, only males are allowed to use the sauna. From 21:00 onwards, females and families can use the sauna with prior request. Location - it seems to be in an underdeveloped part of town Facilities and decor are a bit dated Eating options were limited - not a full restaurant. Short staffed for dinner service (probably only one person for service and kitchen) Neighbourhood noise - trial motobike noise from close by, which decreased after sundown. There was only one small wardrobe in the apartment for 5 people which meant living out of suitcases for a week. The mini kitchen could have been slightly better equipped but it was adequate and we managed. The lighting in the lounge was poor.